Here´s a guide to help you understand what is what in the age of connected things. We explain 185 IoT terms and technologies you might encounter. 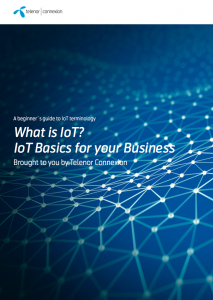 Have this Internet of Things guide at hand to stay smart about everything smart: from smart devices, through communication technologies, to terms associated with the Internet of Things (IoT)! Click to download the free guide and learn more! But first, what is the Internet of Things? The concept of connecting any device (i.e “thing”) to the Internet (and/or to each other) to make it talk, listen and/or perform tasks. This includes everything from cellphones, coffee makers, washing machines, head-phones, lamps, wearables, and almost anything else you can think of. INTRO – The Internet of what? A communications style emphasizing data transfer between large (sometimes industrial) machines that makes use of near-instantaneous data transfer to facilitate higher efficiency and pre-empt problems. Coined in 1999, this refers to the active exchanged of information between devices previously unconnected. A component that is responsible for moving and controlling a mechanism or system, such as opening a valve. A wireless network device that acts as a portal for devices to connect to a local area network. A device is a unit of physical hardware or equipment that provides one or more computing functions within a system. Small transmitters that connect to Bluetooth and Bluetooth Low Energy (BLE)-enabled devices such as smartphones or tracked packages. A “hub that translates” communication between two computers or devices that allows these to understand each other´s data transfer and communication. Integrations of computation, networking and physical processes with feedback loops where physical processes affect computations and vice versa. Describes technologies that allow a smart card, mobile phone or other device to connect wirelessly – without contact – to an electronic reader, typically in order to make a payment. A digital replica of physical assets, processes, people, places, systems and devices that can be used for various purposes and integrates historical machine data into a digital model. The use of GPS or RFID technology to create a virtual geographic boundary in which devices can operate. A system designed to capture, manipulate, analyze, manage and present spatial or geographic data. A technology created by the US Government that allows for location services. The science of applying tactile sensation and control to interaction with computer applications. The use of a computer’s physical components to support the software that creates and manages virtual machines (VMs). A device that measures and reports a body – such as a drone’s – specific force, angular rate, and sometimes the magnetic field surrounding the body. A remote sensing technology which uses the pulse from a laser to collect measurements which can then be used to create 3D models and maps of objects and environments. Engineering of both electrical and mechanical systems which includes a combination of robotics, electronics, computing, telecoms, systems, control and product engineering. A detection system that uses radio waves to determine the range, angle, or velocity of objects. A method of monitoring an asset by using GPS and onboard diagnostics to record movements on a computerised map. The embedded SIM (also called eSIM or eUICC) is a secure element designed to remotely manage multiple mobile network operator subscriptions and be compliant with GSMA specifications. The unique serial number embedded on a SIM card. A unique number, usually fifteen digits, associated with identifying a GSM-connected device. A small electronic device embedded in objects, machines and things that connect to wireless networks which sends and receives data. A hardware device that allows a computer to send and receive data over a telephone line or a cable or satellite connection. A hardware device designed to receive, analyse and move incoming IP packets to another network. A microchip with all the necessary electronic circuits and parts for a given system, such as a smartphone or wearable computer, on a single integrated circuit. A smart card that stores including identity, location, phone number, network authorisation data and security keys that is installed into a wireless device. A modem that bypasses the telephone system and connects directly to a wireless network, through which it can directly access the Internet connectivity. (also known as C2K or IMT-MC) is a family of 3G mobile technology standards for sending voice, data, and signaling data between mobile phones and cell sites. General Packet Radio Service (GPRS) is a packet oriented mobile data service on the 2G cellular communication system’s global system for mobile communications (GSM). Global System for Mobile Communications (originally Groupe Spécial Mobile), is a standard developed by the European Telecommunications Standards Institute (ETSI) to describe the protocols for second-generation (2G) digital cellular networks used by mobile phones, first deployed in Finland in July 1991. A 3G mobile broadband communications technology. HSPA networks offer a maximum of 14.4 Mbps of throughput per cell. A mobile network operator owns and runs a cellular network and provides services over it. A provider of wireless network services to customers without owning wireless network infrastructure itself. A company that provides network infrastructure and related services, such as provisioning, administration and OSS/BSS, to enable mobile virtual network operators (MVNOs) to offer services to their own customers. The second-generation cellular technology that introduced call and text encryption, plus data services such as SMS, picture messages and MMS. The third generation of cellular technology which delivered faster data-transmission speeds, enabling video calling and mobile internet. The fourth generation of cellular technology, released in 2008, which brought further increases in speed so HD mobile TV, video conferencing and other apps were enabled. 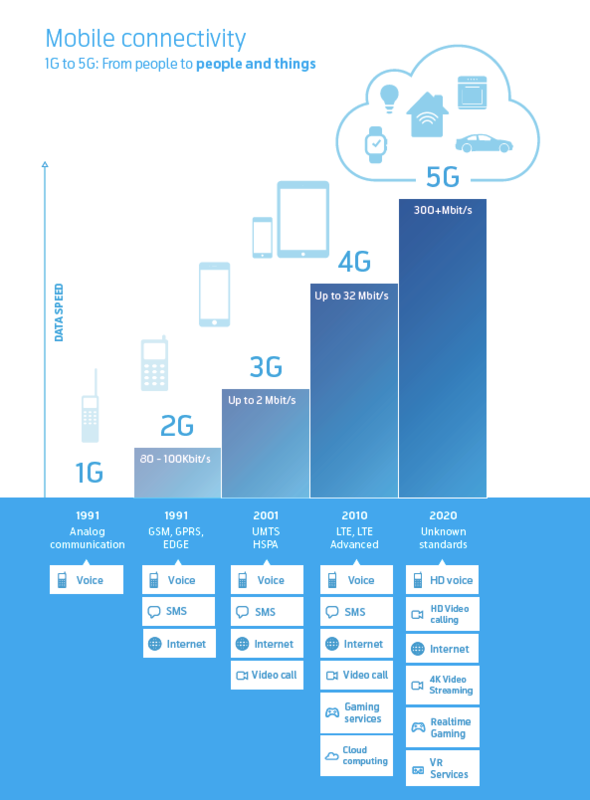 The current generation of cellular technology with deployment commencing in 2008 offers even greater speeds of up to 100Gbps, lower latency and greater device density per cell. A standard for 4G wireless broadband technology that offers increased network capacity and speed to mobile device users. A cellular network is a radio network distributed over land through cells where each includes a fixed location transceiver known as base station. A form of virtualization that allows multiple logical networks to run on top of a shared physical network infrastructure, helping to ensure maximised network utilisation and optimal connectivity for each app. Roaming enables a travelling wireless device to keep connected by visiting another network when it leaves its home location. A new iteration of Bluetooth technology aimed at servicing IoT devices. A network that interconnects devices within a limited area with a locally managed network equipment. Most commonly seen as a connection between two devices by way of an Ethernet cable. A local network topology in which infrastructure connects directly, dynamically and non-hierarchically to as many other nodes as possible and cooperates with one another to route data to and from clients. A method in radio of multiplying the capacity of a radio link using multiple transmit and receive antennas. A set of communication protocols that enable two electronic devices, one of which is usually a portable device such as a smartphone, to establish communication by bringing them within about 4 cm (2 in) of each other. Formerly known as Trans-European Trunked Radio, TETRA is a European professional mobile radio and two-way transceiver specification that offers secure voice and data transmission. A method that virtualizes network functions in the RAN using platforms based on general purpose processors which aims to provide greater flexibility and cost efficiency. A network that extends over a large geographical area. A wireless network consisting of spatially distributed autonomous devices using sensors to monitor physical or environmental conditions. A technology that allows for wireless device communication over specific radio brands. WiFi, which is not an abbreviation, is the most common technology used for wireless Internet connection. This network functions the same way as a LAN does, except that a device can connect to the network wirelessly. A communications technology typically used in security automation and smart homes because of its low energy radio waves which enable it to communicate from appliance to appliance. A WAN that functions using a low bit rate and typically incorporates or caters to smart devices. A technology providing data communications over a low-power WLAN that is typically used for low-data rate, low power communications, often in control or sensor networks. A standard-based Low Power Wide Area technology. It is based on eGPRS and designed as a high capacity, long range, low energy and low complexity cellular system for IoT communications. A Long Range, low power wireless standard intended for providing a cellular-style low data rate communications network. Aimed at the M2M and IoT market, LoRa is suitable for intermittent low data rate connectivity over significant distances. LTE-M is used to refer to the LTE-MTC standard defined by the GSMA, more specifically LTE CatM1. LTE-M is Low Power Wide Area technology which allows the reuse of an LTE installed base with extended coverage. A narrowband radio technology specially designed for the Internet of Things (IoT), hence its name. Special focus of this standard is on indoor coverage, low cost, long battery life, and large number of devices. This technology can be deployed in GSM and LTE spectrum. Sigfox is a cellular style system that enables remote devices to connect using ultra-narrow band, to provide low power low data rate, and low cost communications for remote connected devices. A device management protocol designed for sensor networks and the demands of a machine-to-machine (M2M) environment. A serial communications protocol for use with programmable logic controllers (PLCs) that is used to connect industrial electronic devices. A protocol designed to connect the physical devices and networks with applications and middleware, making it an ideal connectivity protocol for IoT and M2M. A descriptive term for fully automatic data generation, exchange, processing and actuation among intelligent machines, with low or no intervention by humans. The theory and development of computer systems able to perform tasks normally requiring human intelligence, such as visual perception, speech recognition and decision-making. AI also enables machines to learn from experience. A part of computer science working to enable computers to see, identify and process images in a manner similar to human vision. A machine learning technique that teaches computers to learn by example. Machine learning is a method of data analysis that automates construction of analytical models, based on the idea that systems can learn from data, identify patterns and make decisions with minimal human intervention. A computer system modelled on the human brain and nervous system that is designed to help machines reason more like humans. A set of routine definitions, protocols, and tools for building software and applications. An API connects your business processes, services, content, and data to channel partners, internal teams, and independent developers in an easy and secure way. APIs are becoming the de facto standard by which companies exchange data and build consistent cross-channel customer experiences. A gateway that translates communications between telecommunications and computer networks (most often the Internet). A model in which computation is largely or completely performed on distributed device nodes known as smart devices or edge devices as opposed to taking place in a centralised cloud environment. A specific class of computer software that provides the low-level control for the device’s specific hardware. FOTA refers to the capability of upgrading firmware over-the-air. Also known as edge computing or fogging, Fog computing is a term created by Cisco that refers to extending cloud computing to the edge of an enterprise’s network. A type of dataflow programming in which programme steps communicate with each other by transmitting data through some kind of channel. The channels are managed by the larger system, leaving the connected components free to focus on processing input and producing output. A cloud computing environment that uses a mix of on-premise, private cloud and third-party, public cloud services with orchestration between the two platforms. OTA provisioning refers to various methods of distributing new software, configuration settings, and even updating encryption keys to devices of sorts. Describes software for which the original source code is freely available and can be redistributed or modified. Peer-to-peer computing or networking is a distributed application architecture that partitions tasks or workloads between peers. Peers are equally privileged, equipotent participants in the application. Also referred to as a RESTful web service a RESTful API is based on representational state transfer (REST) technology, an architectural style and approach to communications often used in web services development. Simple Object Access Protocol (SOAP) is a communication protocol for the exchange of information between various operational systems using Extensible Markup Language (XML). Amounts of data that are so large that traditional technologies cannot handle their transfer or analysis. Certain IoT technologies specialize in handling and transferring big data as it is seen as key to large companies’ goal to maximize efficiency. A growing list of records, called blocks, which are linked using cryptography. For use as a distributed ledger, a blockchain is typically managed by a peer-to-peer network collectively adhering to a protocol for inter-node communication and validating new blocks. Describes a wide range of strategies for refining data sets so they provide what a user, or set of users, needs without including other data that can be repetitive, irrelevant or even sensitive. A data janitor is a person who takes large amounts of big data and condenses it into information that businesses can act upon. An approach to business governance that values decisions that can be backed up with verifiable data. An open source distributed processing framework that manages data processing and storage for big data applications running in clustered systems. The embedding of computational capability into everyday objects to make them effectively communicate and perform useful tasks in a way that minimizes the end user’s need to interact with computers. A computer system for gathering, analyzing and controlling real-time data. The Internet Protocol suite is the computer networking model and set of communications protocols used on the Internet and similar computer networks. A unique identification or serial number that all mobile phones and smartphones have. It is normally 15 digits long. A barcode symbology and numbering system used in global trade to identify a specific retail product type, in a specific packaging configuration, from a specific manufacturer. A globally unique number identifying a physical piece of CDMA2000 mobile equipment. RFID devices are used for data transmission and capture by way of radio waves. A number given to any device within any system to allow the ability to interact with it. A string of characters that unambiguously identifies a particular resource. A network of private computers infected with malicious software and controlled as a group without the owners’ knowledge. This came into force in May 2018 and imposes rules on controlling and processing personally identifiable information. A secure network protocol suite that authenticates and encrypts the packets of data sent over an internet protocol network. IPSec uses cryptographic security services to protect communications over IP networks. A collective term used to describe different types of control systems and associated instrumentation, which include the devices, systems, networks, and controls used to operate or automate industrial processes. A framework for business processes that facilitates the management of electronic or digital identities. A set of roles, policies and procedures needed to create, manage, distribute, use, store and revoke digital certificates and manage public-key encryption. PKI is a critical enabler of secure communication, data and money exchange. An encryption protocol used to protect data in transit between computers enabling two computers to agree to encrypt the information in a way they both understand. The management of a network and systems, presented to the client in a web interface. In a sense, it’s a specialized version of SaaS, where the first “S” involved is management software. A form of cloud computing that provides virtualized computing resources over the internet. A cloud computing model in which hardware and software tools are delivered to users over the internet. Describes industries using their products to sell an outcome as a service, usually for a recurring subscription, rather than as a one-off sale of a product. As things become more interconnected in the IoT, it becomes increasingly difficult to draw boundaries between industries and business verticals. Smart things are manufactured in smart factories and distributed by the smart supply chain. Once in place, those things make up smart buildings, which, along with smart vehicles and smart people make up smart cities. Those cities become connected to their neighbors. Facilitates health and wellbeing of patients and the enhancement of professional medical practice through the use of information management and information and communication technology. A user interface or dashboard that connects a person to a machine, system or device. It is most commonly used in the context of an industrial process. Describes the machine to people connections that occur when information is transferred between a machine and a person. The interconnection of information technology devices within the range of an individual person, typically within a range of ten metres. This concept incorporates technology for data acquisition into aspects of a person’s daily life. Inputs such as food consumed and surrounding air quality are collected, states such as mood and blood oxygen levels are monitored and performance such as mental awareness and physical fitness are assessed. A home that contains smart products which can be controlled, customized, and automated remotely. This includes controls for temperature, lighting and locks. When used in commercial construction, this is sometimes called ‘Smart Building’. Functionality in autonomous homes range from security systems and climate control to automated televisions, dishwashers, laundry machines, and other appliances. Apple’s HomeKit and Google’s Nest are popular applications. A non-proprietary data format for the publication of a subset of building information models (BIM) focused on delivering asset data as distinct from geometric information. The technology that enables indoor and vehicular environmental comfort. Are everyday items that have small, wireless computing devices attached to them to enable data to be collected and transmitted, typically using Bluetooth. A connected (usually by WiFi) LED light-bulb that typically allows for remote control, automation, and customization. Voice activated software agents that can perform tasks or services for an individual. Sometimes called virtual assistants. • A power grid of the utilities company that is enabled to work with smart meters and smart homes to provide a more customized and eco-friendly experience to the consumer and to save on the costs of wasted electricity as found in traditional electricity grids. A city or metropolitan area that utilizes data and technology to create efficiencies, improve sustainability, create economic development, and enhance quality of life factors for people living and working in the city. A connected vehicle (see also Customer Case Volvo) is equipped with Internet access, and usually also with a wireless local area network. Systems to help the driver in the driving process. When designed with a safe Human-Machine Interface (HMI), they should increase car safety and more generally road safety. Are vehicles that can guide themselves without human intervention. Also known as driverless cars and self-driving cars. A European in-vehicle system that automatically alerts emergency services of a road accident and will also inform the rescue workers about the crash site’s exact location. Is the umbrella term for the car’s communication system, where information from sensors and other sources travels via high-bandwidth, low-latency, high-reliability links, paving the way to fully autonomous driving. A secure vehicle to cloud framework for virtualized and on-demand service provisioning. The wireless transmission of data between motor vehicles. The goal of V2V communication is to prevent accidents by allowing vehicles in transit to send position and speed data to one another over an ad hoc mesh network. Also known as pay as you drive (PAYD), is a type of vehicle insurance whereby the costs are dependent upon type of vehicle used and mileage covered measured against time, distance, behavior and place. An automotive term referring to a vehicle’s self-diagnostic and reporting capability. OBD systems give the vehicle owner or repair technician access to the status of the various vehicle subsystems. A company (or function) that takes care of vehicle manufacturers’ need to route data and voice to and from the vehicles produced. A generic term for any embedded system that controls one or more of the electrical system or subsystems in a transport vehicle. An unbroken cold chain is an uninterrupted series of refrigerated production, storage and distribution activities, along with associated equipment and logistics, which maintain a desired low-temperature range. The transfer of structured data from one computer application to another by electronic means and with a minimum of human intervention. It also describes the electronic exchange of documents between businesses and organizations including government agencies. Deployed in many busy waterways throughout the US to provide key environmental parameters including water levels, currents, waves, salinity, bridge clearance (air gap), winds, air and water temperature and visibility. A product and service identification code, often portrayed as a machine-readable bar code that helps the item to be tracked for inventory. Focuses on execution-oriented applications, including warehouse management systems (WMSs), transportation management systems (TMSs), global trade management (GTM) systems and other execution applications, such as real-time decision support systems and supply chain visibility. A twenty-foot equivalent unit is an inexact unit of cargo capacity used to describe the capacity of container ships and container terminals. A digital architecture that allows for two-way communication between a smart meter and a provider, by way of an IP Address. The technology of automatically collecting consumption, diagnostic, and status data from water meter or energy metering devices and transferring that data to a central database for billing. A comprehensive list of parts, items, assemblies and other materials required to create a product. A technology that designs a product and documents the design’s process. CAD may facilitate the manufacturing process by transferring detailed diagrams of a product’s materials, processes, tolerances and dimensions with specific conventions for the product. A utility supply network that uses digital communications technology to detect and react to local changes in usage. Systems that connect physical and digital entities are connected, monitored and managed with computer programming and algorithms. The integrated management of core business processes, often in real-time and mediated by software and technology. An inventory management method whereby materials, goods, and labor are scheduled to arrive or be replenished exactly when needed in the production process. A visual system for managing work as it moves through a process. Kanban visualizes both the process and the actual work passing through that process. An information system that connects, monitors and controls complex manufacturing systems and data flows on the factory floor. The process of managing the entire lifecycle of a product from inception, through engineering design and manufacture, to service and disposal of manufactured products. A formalized system that documents processes, procedures, and responsibilities for achieving quality policies and objectives. Describes an environment in which computers are in charge of decision-making. In a smart manufacturing environment, physical and digital are connected and communicate with one another to improve production. A broad category of manufacturing with the goal of optimizing the manufacturing process. 3rd Generation Partnership Project is a collaborative project established in 1998 aimed at developing globally acceptable specifications for third (and future) generation mobile systems. An organization focused on driving the network and computing infrastructure needs of automotive big data. Describes itself as the “world’s largest technical professional society.” It aims to promote standardization through international electronics development. The United Nations specialized agency for information and communication technologies – ICTs. The ITU allocates global radio spectrum and satellite orbits and develops the technical standards that ensure networks and technologies seamlessly interconnect. uniting nearly 800 operators with more than 250 companies in the broader mobile ecosystem, including handset and device makers, software companies, equipment providers and Internet companies, as well as organisations in adjacent industry sectors. The GSMA organizes the largest annual event in the mobile industry, the GSMA Mobile World Congress. The World Wide Web Consortium is the main international standards organization for the World Wide Web (abbreviated WWW or W3). An IoT example. Read more!